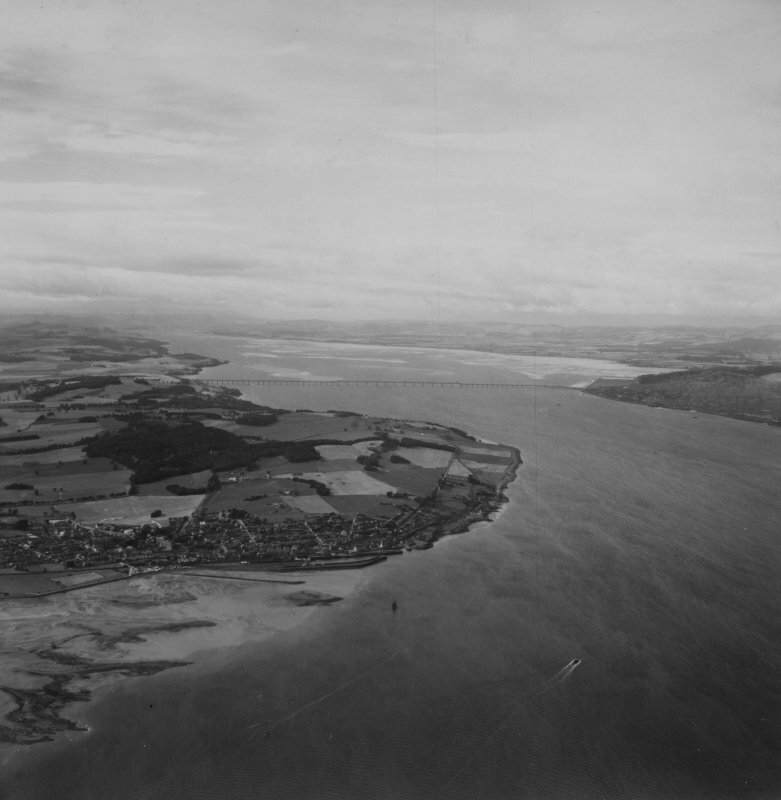 Firth of Tay and Tayport. Oblique aerial photograph taken facing west. This image has been produced from a crop marked print. Station probably opened 13.5.1879 (Newport Railway); closed 9.1.1956 for passenger trains to Leuchars and 18.9.1967 for all traffic. 'Station opened originally in 1848 under the auspices of the Edinburgh and Northern Railway; it was the northern terminus. The line was extended to East Newport in 1878 and to Wormit and Dundee on 13 May 1879'. Information from Mr A Nisbet 27 September 2001. No evidence could be found of the railway station which stood immediately E of Tayport Dock (NO42NE 75). The station of two platforms, with the main station buildings on the W side with a passenger shelter on the E side platform. At the N end was a footbridge and signal box guarding a level crossing allowing road traffic into the docks. In the area around the docks were extensive freight sidings serving both the harbour and a large timber yard. The station and surrounding area are visible on RAF WW II oblique aerial photographs (NLA 66, frames 0034-0035, 0037, 0039-0040, 0044, flown 2 July 1943).